Chalk Up Another Handmade Monday! 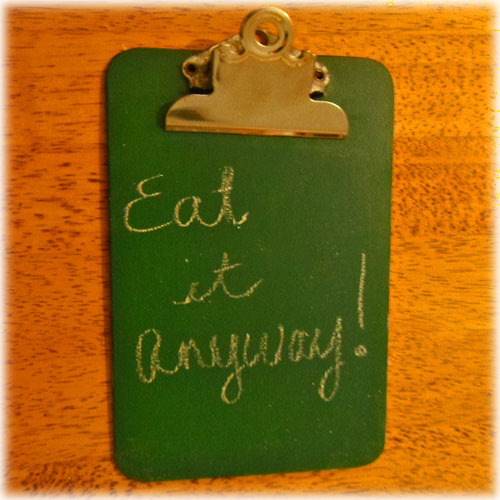 You are here: Home / Crafts / Chalk Up Another Handmade Monday! Running very late this Handmade Monday! I actually did spend the weekend relaxing but also made a little something for a special little boy. It’s an upcycle/recycle project. I have been wanting to try using that chalkboard paint everyone else has already done a million things with, and I have had a jar of it on my shelf for, well, I don’t know how long. I had a little clipboard that I used to use for school (for something, I don’t even remember what) that was too cute to get rid of, but I haven’t used it in forever. I got the idea to paint one side with chalkboard paint and personalize it and give it to my grandson (my son’s stepson who is 8 and I think just the right age to love writing on things with chalk –plus he’s very into sports, I think he could keep score or something with it, but mostly, I just remember thinking writing with chalk was very cool when I was a kid). It turned out to be really easy to work with. The hardest part? Finding chalk! But I found a nice box that included white and some colors too at Target, after checking the office supply place first. You can see what I did, with photos at Paint a Chalkboard. Then you can go and check out Handmade Monday, which I understand is also going to be moving very soon. But don’t worry, I will be sure to give you a good link when that happens, I wouldn’t leave you high and dry! I wanted to find some chalk last year and I had lots of problems finding some too. It doesn’t seem to be as popular as it used to be. Great idea – I like the idea of using different colours for chalkboards. I love chalkboards, I love all the different colours you can get now, it used to be plain old black but now there is so much choice. A great make.